The NBA regular season kicks off tomorrow night and if you’re a big fan of the League, you’ve probably read yourself a fair amount of previews and predictions for the upcoming campaign. 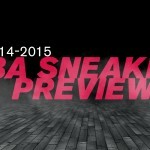 We won’t throw our hat in the ring (fitted, snapback, or bucket) but we will hit you with a preview of what the season in kicks should look like and who you should be looking out for to drop some gems. Charlotte Hornets: In a move that legions of NBA fans were waiting for, Michael Jordan converted his Charlotte Bobcats back into one of the most successful off-court basketball brands in history: the Charlotte Hornets. Now a full generation removed from the Larry Johnson and Mugsy Bogues led Hornets, a new wave of players will don the teal and purple. As a result, an entire team will now, by default, sport some of the loudest shoe colorways in the league. Look for big things from Under Armour’s Kemba Walker and, of course, Jordan Brand’s own Michael Kidd-Gilchrist and Bismack Biyombo will be hooked up directly from the boss-man. Toronto Raptors: There were no branding or team name or color changes in Toronto but last season this team brought heat night in and night out. The lone Canadian team deserves mention on their kick game alone, however, official Raptors ambassador Drake is now officially a member of Team Jordan. Time will only tell if this will effect the team’s shoe game or not but it certainly can’t hurt. Nor can the fact that this young team is clearly on the rise in the Eastern Conference. Damian Lillard: Damian Lillard is one of the fastest rising stars in the NBA and deservedly so. At just 24 and in his third season as the Blazers floor general, he has the full backing of Rip City and adidas. As proof, early next year, Lillard will be added to their roster of NBA signature athletes with Derrick Rose, Dwight Howard, and John Wall. Though he’ll start the season as the face of the new adi Boost Crazy Light 4, Lillard will sport his very own kicks come 2015. Derrick Rose: It’s been two years since Derrick Rose has been at full health with so much excitement to enter the season. Some experts have even tabbed the Bulls as the favorites in the Eastern Conference. Unlike Rose’s return last season, Derrick has already proven he’s returned to the player he once was with a strong showing at the FIBA Basketball World Cup where USA took gold and in an impressive pre-season for Chicago. 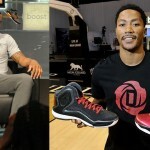 More importantly, the adi D Rose 5, the first signature basketball shoe to incorporate adi Boost technology, has already dropped and is next up in Rose’s signature line of kicks. John Wall: Though his move from Reebok to adidas is already a full season old, Wall will join the likes of Kobe Bryant as All-Stars of recent memory with signature shoes from two different brands. Later this month the adidas John Wall 1 will drop exclusively at Foot Locker but you’ll be able to see them in action for the first time in our newest Foot Locker Approved X addias commercial (and also on court as Wall begins a very important and pivotal season that has the potential to see his Washington Wizards vaulted to the top of the NBA power rankings). Jeremy Lin: While he might not be top of mind when you’re thinking about NBA sneakerheads, Jeremy Lin is one of adidas’ most marketable players and his arrival in Los Angeles will give the three stripes huge opportunities in the country’s second largest media market – not to mention his already booming popularity in Asia. The former Harvard man has been on a roll releasing viral videos this summer, including this one from adidas. It’s been a long time since adidas has had a star in LA so don’t sleep on the kicks that the Lakers starting point guard will be lacing up this season. LeBron James: In case this is the only NBA article you’ve read since the 2013-2014 season wrapped up we’ll take it upon ourselves to inform you that LeBron James left the Miami Heat to return home and sign for the Cleveland Cavaliers. While this obviously has huge implications for the NBA in terms of talent distribution, the King’s move to Cleveland has a pretty significant impact on the sneaker industry as well. If you were a fan of Heat themed colorways of LeBron’s signature shoe, you’re probably going to be disappointed, but the move to the Cavs opens up a whole new arsenal of colors that we’ll see the LeBron XII released in. In the past, Cleveland has had some pretty loud uniform colorways that have ranged from black/orange/blue to wine/gold and this year a new uniform to celebrate Lebron’s return in navy/wine/gold. Expect LeBron to surprise with new heat every time the team plays in one of these retro or alternate uniforms. Kobe Bryant: Kobe Bryant will finally get a chance this week to wear the Nike Kobe IX during a regular season game for the first time. Bryant’s ninth signature shoe with Nike is also one of the most unique releases we’ve seen over the course of the past year and, though it’s been a success technically and stylistically to this point, it obviously needs to be worn on court by its namesake to complete the grandeur. Kevin Durant: Unfortunately for the Thunder, NBA fans, and Durant himself, the Durantula will be sidelined for 6-8 weeks with a bone fracture in his foot. Fortunately for sneaker enthusiasts, Nike has begun to release Durant’s signature line annually in the summer. The Nike KD VII has been in stores since mid-summer and we were just treated to the “On The Road” colorway last weekend. Everyone at Foot Locker wishes Kevin a speedy recovery from his surgery and we hope to see him stronger than ever come his return. Kyrie Irving & James Harden: We’re including Kyrie on this list for a number of reasons that should lead to the spotlight being on both him and his footwear. First, the Cavs have become the center of basketball universe due to LeBron’s return to northeast Ohio. Secondly, due to the gruesome injury to Paul George of the Pacers, Kyrie, along with James Harden, become that much more important to Nike’s non-signature basketball marketing efforts. Kyrie will sport the Nike HyperRev and Hyperdunk to kick off the season while Harden is expected to lace up the Nike Zoom Run The One as he did during his legendary game of Horse With Harden. 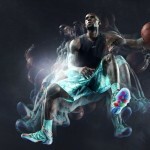 Blake Griffin & Russell Westbrook: In the last full year, Blake Griffin and Russell Westbrook have become the faces of Jordan Brand’s performance basketball lines – the Super.Fly and the Air Jordan, respectively. Though the pair are competitors for legitimate contenders in the Western Conference, they team up to provide the faces of what could be one of Jordan’s most successful years of on-court performance kicks with the releases of the Air Jordan XX9 (fronted by Westbrook) and the Super.Fly 3 (Griffin). Chris Paul & Carmelo Anthony: Bonafide NBA superstars Carmelo Anthony and Chris Paul had very different off-seasons. Paul welcomed a new owner to the Los Angeles Clippers family why Melo rebuffed the suitors to remain home with the New York Knicks. As stars of their respective teams and two of the most recognizable faces in the League, the duo also account for the two signature basketball lines from Jordan. Paul will be releasing the Jordan CP3.VIII on November 5th while Melo’s Jordan M11 is scheduled to drop for the first time in January. 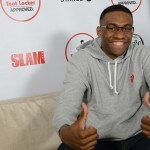 Jabari Parker: The Milwaukee Bucks rookie and number two overall pick in the 2014 NBA Draft from Duke, signed with Jordan Brand before he was drafted into the NBA – leading him to wear this awesome tie clip to the Draft. While Parker is not a signature athlete (yet) keep an eye on the young Buck in Milwaukee to be rocking some heat on and off the court as the season gets underway. Stephen Curry: While Kemba Walker gets brand new colorways in Charlotte from UA due to his team’s branding change, Curry has been the face of the Under Armour ClutchFit Drive and will release his second wave of Player Edition colorways later this week. Steph already rocked his USA colorways of the Drive in Spain during the FIBA Basketball World Cup and will be making it rain in the same model all season from Golden State. Isaiah Thomas: The former Sacramento Kings point guard left California’s capital for the desert this offseason and joined the Phoenix Suns to form the mind boggling trio of point guards there that already included Goran Dragic and Eric Bledsoe. Thomas is also the most prolific endorser of Reebok basketball in the NBA right now so look to Arizona to see new colorways of some Reebok classics on the feet of the agile former Washington Husky. Moving into 2014, adidas Originals is set to reintroduce a necessarily New York classic to the pavement. The three stripes have officially unveiled a look at the Attitude Hi, a sneaker most notable for its run in the ’80s as Patrick Ewing’s former signature shoe. While the Knicks great has long retired, the Attitude Hi finds brand new life in its timeless combination of white, blue and orange, all executed with premium leather and mesh per the original design. True to its heritage in Madison Square Garden, the athletic, high-rising silhouette features a custom adidas Basketball label at the top of the tongue. 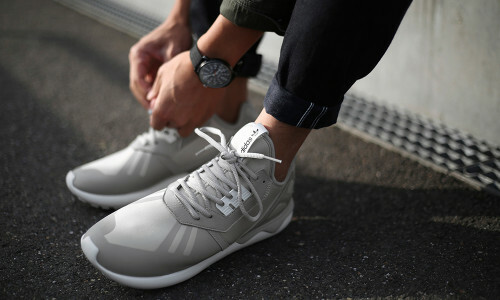 Look for this release from adidas Originals to drop on January 10, 2014.